Some of us just ‘eat to live’ while other ‘live to eat’. So which category you fall in? Let us know. Who does not life food, well I just love it? We crave food every now and then, every time when we are at home we like to dine out & explore but when we are out of our houses we yearn for homemade food. It is human nature to get prone to what gives him pleasure and food always is the source of happiness and pleasure for us all. There are very less people who think food is not their business and priority, but wait up. Will you ever be able to perform good if your belly is empty? Mind does not work effectively if it is not suitably fed. So make sure you are eating properly. Keep an eye on all the nutrients you are devouring on day to day basis and when you keep a reality check on the diet plan you remain fit and healthy forever. Exercising, gym and gaming give a new life and vitality to your body, so going off a gym for an hour or two does not hurt nobody. Playing the favorite sport everyday keeps you active and energizes you as well. So what are you waiting for? Fasten your seatbelts to have a healthy lifestyle. Well how often do you go out for food? Once, twice or maybe thrice in a week? Hunting on new restaurants and becoming a food blogger is quite in fashion these days. People love to do food photography and post on social media, & why not? Be inventive with what you do, even if you are a designer yourself, you still can play with numerous ideas. Here I am putting forward a free restaurant menu / flyer mockup that can be used for both commercial and personal projects, also can be displayed for a client and on a website of café/restaurant to show people and visitors about hotel’s/restaurant’s menu and how does it work with charges. The entire range of dishes and variety is being put up on the menu card so to get the glare what is really in service and can be ordered. 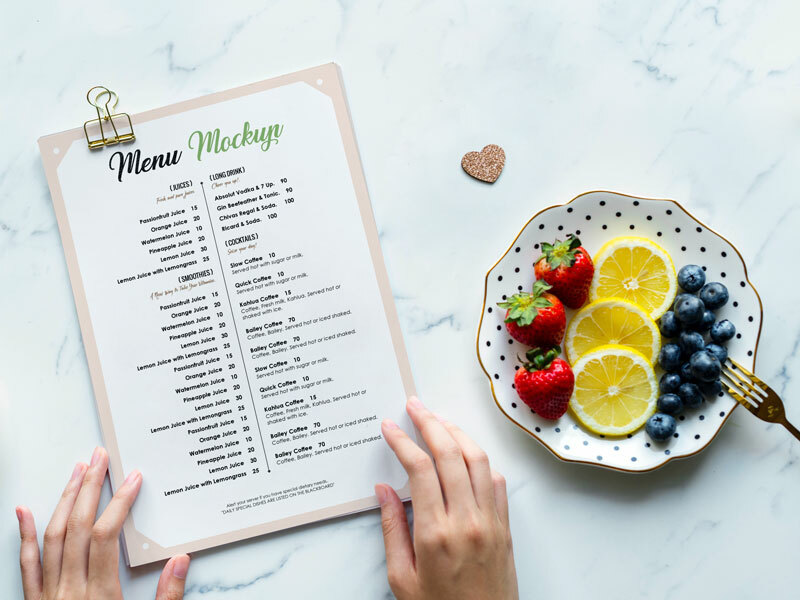 Restaurant menu flyer has to be built in a way to make it look appetizing so the consumer feels hungry while ordering. For more amazing collection of art/design stay tuned to the blog. Here we go.